EVENT HAS BEEN UPDATED - Including information for Missouri CLE Hours***!!! 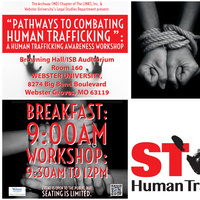 A HUMAN TRAFFICKING AWARENESS WORKSHOP"
Open to the public, but seating is limited. Please RSVP through the FB event.